Dropbox has a futuristic vision for how its users will be able to share massive files and have quick access to them on their computers, without their hard drives overflowing. The cloud storage company announced a new initiative at its Open conference in London on Tuesday called Project Infinite. It's a push to create a new Dropbox interface that allows users to see all of the files they've stored in the cloud in their computer's file explorer without requiring them to keep local copies of each document, image, spreadsheet or other file. 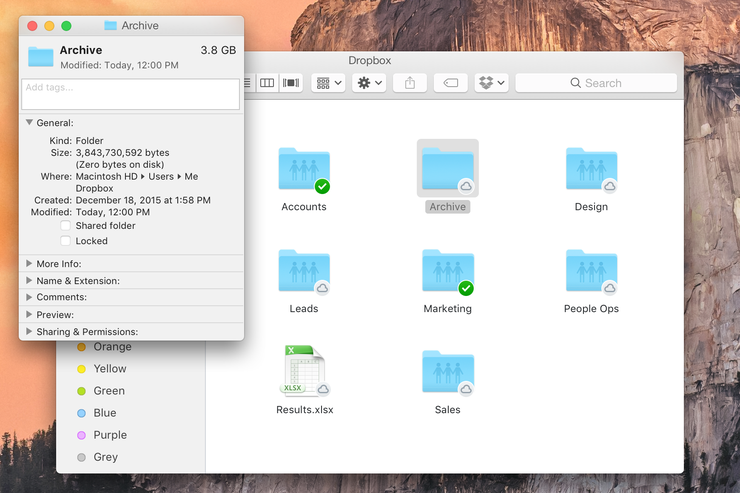 With Project Infinite, users will be able to manage their files in the cloud by moving them around inside the Mac OS X Finder or Windows File Explorer, just like they would any local files that are taking up space on their hard drives. Right now, Dropbox users who want to see the items they have stored in the company's cloud among all their other files need to have those files downloaded to their Mac or PC -- just like they did when Dropbox launched its product to the public seven and a half years ago. Users can save storage space on their computers with a selective sync feature that only downloads some files, but the data people leave out can't be seen on their computers at all. Project Infinite would take Dropbox’s basic concept of creating folders that sync to the cloud and make it easier to work with an epic volume of files. It's part of the company's emphasis on helping users share files between one another, specially business users who pay for one of the company's premium tiers. Still, it's a cool tech demo that could help convince more businesses to choose Dropbox when they're considering a paid cloud storage service. The company is pushing hard for commercial adoption and announced Tuesday that it has more than four times the commercial customers now in Europe than it did two years ago. The company also announced a new File Properties API that will allow people to apply custom metadata to files stored in Dropbox for use with third party tools. That should help better enable applications like digital loss prevention services and data migration services.